Celebration Chocolate Fountain denton area ,also Candy Floss Machine Hire denton area,ideal for school fundraising please enquire. We are a Manchester based company offering the best service you will find in the area with many happy customers and over 10 years experience, we cover the whole of the north west. We only use fine Belgian chocolate with no oil added as some companies do and our attendants are trained in food hygiene. We now also offer candy floss machine hire in Manchester, sweet candy bars and personalised chocolate bars. collection Manchester area and surrounds. We also provide Candyfloss machine hire Manchester, Altrincham, Wilmslow , Macclesfield and surrounds. Phone or email for prices and offers. We have provided fountains for the BBC, Sky TV, Local Celebrities and Footballers, Local Councils and Schools. Thanks very much for the service you provided, it was really enjoyed by all. 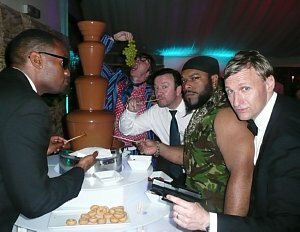 We also cater Corporate chocolate fountain hire at corporate events. Not only an indulgent dessert a chocolate fondue can be a great ice breaker and talking point at weddings and other events where guests may not know each other. Our candy floss machine makes a great addition and is a great unusual party entertainment idea for weddings and proms in denton. We have supplied chocolate fountain Indian weddings and Chocolate fountain for Asian Weddings with halal chocolate fountains, we can supply vegetarian chocolate fountains. We only use the finest belgian curvature chocolate which tastes amazing and has a high proportion of cocoa butter that makes the chocolate flow smoothly. The chocolate is availiable in milk, dark, white or chocolate orange flavours. Our spectacular fountain packages can be tailored to your needs.We provide skewers, paper plates and napkins. Our smartly dressed staff are polite and friendly and trained in food hygiene.